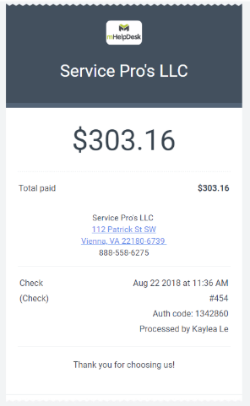 Email receipts of payment to your customers! Email a payment receipt to your customers for all payments received. You can choose to send the receipt on each payment so only those customers who want one will get one. To send a receipt, open up any Invoice and go to the Payment tab. Hit the Receive Payment button, which will open up the screen below. Check Send Receipt, confirm the email address receiving the receipt, and hit Save and Send. To resend a receipt, click on your Payments tab. Under the header Receipt, click Resend on the associated payment.